Life : A roller coaster ride: And the Mountains Echoed.. Writing about a book (or as they say reviewing a book) is not that difficult but sometimes I fall short of words to describe a beautiful piece of work and this has actually happened twice when I read "The Kite Runner" and "A Thousand Splendid Suns" by Khaled Hosseini. I remember I came to know about him in 2013 through a friend and immediately ordered a box set from uRead.com. I was completely bowled over by Hosseini's style of knitting stories. Both the books were way beyond amazing. 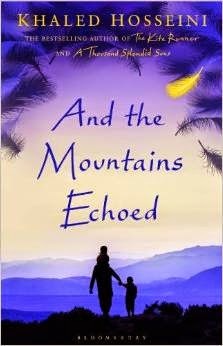 Recently I bought "And the Mountains Echoed" from Amazon.in but before reading this one I made a mental note to write about it on my blog. Afghanistan, 1952. Abdullah and his sister Pari live in the small village of Shadbagh. To Abdullah, Pari - as beautiful and sweet-natured as the fairy for which she was named - is everything. More like a parent than a brother, Abdullah will do anything for her, even trading his only pair of shoes for a feather for her treasured collection. Each night they sleep together in their cot, their heads touching, their limbs tangled. Crossing generations and continents, moving from Kabul, to Paris, to San Francisco, to the Greek island of Tinos, Khaled Hosseini writes about the bonds that define us and shape our lives, and how the choices we make resonate through history. Khaled Hosseini is blessed with an art to write in a way that touches one's heart and soul. He wonderfully describes his characters, their feelings and their struggles in the story. This book revolves around Abdullah and Pari and portrays sibling love in a real dimension. The way Abdullah trades his only pair of shoes to gift his sister Pari a peacock feather, the way Pari calls his brother 'Abollah', the way they wish to stay with each other forever, the way they sing a lullaby together is heart touching. There comes a point when Pari is sold to a rich, childless couple Mr. & Mrs. Wahdati in Kabul. Their pain of separation can be felt. The further chapters describe the relationship between various other characters, their life, their tragedies and their journey. Towards the end when Pari and Abdullah finally reunite, Abdullah is unable to remember anything because of Dementia and this brings mixed emotions as their reunion couldn't happen in true sense. But I also felt that at some point story lost its pace and the focus went on other characters which were not so important. Though I understand that the author tried to show something more in every chapter, it couldn't blend easily or naturally. That's why it lacked the magic of "The Kite Runner". I know Khaled Hosseini is a terrific story teller and I wish him all the very best for his future endeavors. Sorrow ought to be private, not flaunted. All good things in life are fragile and easily lost. But time, it is like charm. You never have as much as you think. What good is regret? It brings back nothing. What we have lost is irretrievable. It was always best to tell the truth, to tell it plainly, without fanfare, and the more disagreeable the truth, the sooner you had to tell it. Khaled Hosseini is an Afghan-born American novelist and physician. He has published three novels all of which are at least partially set in Afghanistan and feature an Afghani as the protagonist. Following the success of The Kite Runner, he decided to stop practicing medicine and became a full-time writer. A teenager who arrived in the United States for the first time at the age of 15 did not speak English ironically went on to become author of three bestsellers. Hosseini is currently a Goodwill Envoy for the United Nations High Commissioner for Refugees (UNHCR). He has been working to provide humanitarian assistance in Afghanistan through the Khaled Hosseini Foundation. He lives in Northern California with his wife, Roya, and their two children (Haris and Farah).